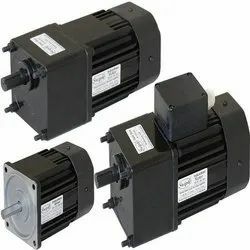 FHP Reversible Motor or Fractional Horse Power Reversible Motor is a combination of FHP Induction Motor and continuously acting internal friction brake. Spring loaded PTFE bushes acting as internal brake, minimises the overrun of rotor after the electric supply is switched off. FHP single phase Reversible motor requires capacitor to start and run while three phase Reversible motor does not require a capacitor. The typical no load speed of the AC FHP Reversible Motor at 50Hz supply is 2880 RPM for two pole winding, 1440 RPM for 4 pole winding, 960 RPM for 6 pole winding, 720 RPM for 8 pole winding and so on. 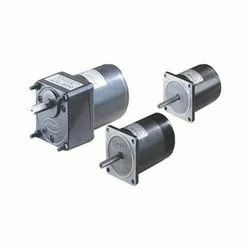 By attaching a gearbox of desired ratio, it becomes low RPM Reversible Gear Motor. 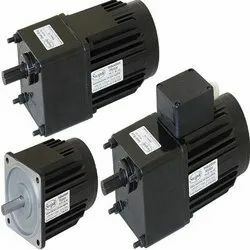 Suitable for short duty and quick reversal, these motors rotate in clockwise and anticlockwise direction. Square Frame sizes are 65 mm, 80 mm, 90 mm. 30 Minute Rating, TE Aluminium Body. Quick Reversal of Direction of Rotation. Terminal Box or Open Lead Wires for Connection. The Gear Boxes are sold Seperately. A coloured background indicates gear shaft rotation in same direction as motor shaft. 30 Minute Rating, TE Alluminium Body. Continously Acting Internal Brake Terminal Box or Open Lead Wires for Connection. A white background indicates gear shaft rotation in opposite direction to the motor shaft. The speed of geared motor is calculated by dividing motor's synchronous speed by gear ratio. The actual speed is less than the displayed value, depending upon the load. Characteristics, specifications and dimensions are subject to change without notice. Looking for FHP Reversible Motors ?